iPhone and iPod touch software, games, toys, calculators and web applications by Kudit: It's back! Our BMI calculator is now iPhone compatible. Kudit is proud to announce the Body Mass Index calculator. A simple Body Mass Index calculator. The Body Mass Index calculator is an adaptation of our popular dashboard widget. 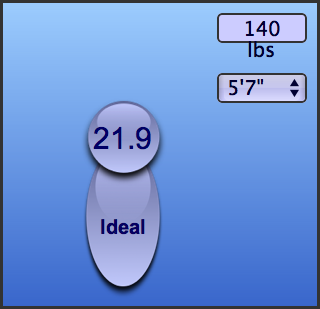 In addition to displaying the BMI value, a textual and visual representation are also displayed.